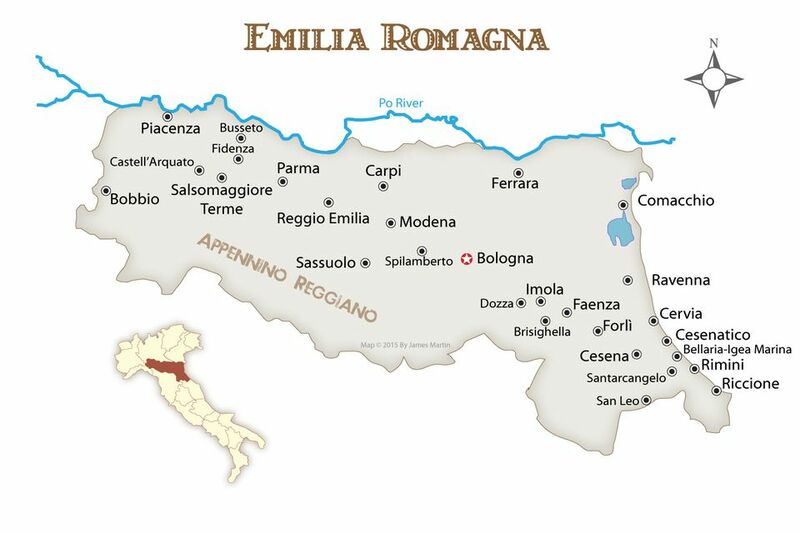 Even among Italians, the regional cuisine of the Emilia-Romagna is considered to be the best in Italy. Wonderful ingredients come from the region, including the famous ham called Prosciutto di Parma, plus Parmigiano-Reggiano cheese, and Balsamic Vinegar of Modena. Some production centers for these foods near Parma and Modena are open to visitors. Stretching along the coast on either side of Rimini are other seaside resort towns with good beaches such as Riccione and Bellaria-Igea Marina. They offer more laid back alternatives to the party feel of Rimini and have good facilities for families. Both towns have hotels on the seaside promenade and have small centers with shops, bars, harbors, and parks. Buses run along the coast road connecting to Rimini and both towns have a train station. In Bellaria Igea Marina, try the family-run Hotel Eliseo with an old-fashioned, welcoming feel. It's a great place to relax while being well taken care of, use the private beach, or try a cooking class. Excellent meals are included in the room rate and once a week there's a special Romagna night with live music and traditional food. In Riccione, check out these Hotel Corallo, a comfortable 4-star hotel with a nice spa, swimming pool, and beach. Cesenatico, built on a canal that runs to the sea, is a great seaside town. There's an excellent nautical museum and along the picturesque canal and seaside promenade, you'll find shops, bars, and restaurants. Cervia is a seaside resort with 10 kilometers of sandy beach. It's a big center for sea salt and there's a sea salt museum you can visit. Comacchio sits in a lagoon and is really a collection of islets connected by bridges. You can take a guided boat ride into the lagoon, a protected area that also offers hiking and biking opportunities. The area is known for its eel fishing and there's a small museum dedicated to the fisheries.